He was a bit of a dasher, and apparently quite a charmer, but Monte Luke will always be remembered as the man who captured the people of his city, their life and times, through a camera lens. From the early 1920s to the Great Depression, World War Two and into the nineteen-fifties, Monte led from the front as the Sydney photographic studio that carried his name focused on the famous and not-so-famous, the rich and poor, sportsmen and business chiefs, artists and actors. Charles Robert Montague Luke, who would become known to one and all as Monte, was born in Geelong, Victoria, in 1885. His father, Edmund Thomas Luke, was a pioneer newspaper photographer in Melbourne and passed the skills of the trade on to his son. Monte’s first job was as a messenger and mixer of chemical compounds for the well known suppliers of photographic equipment, Baker & Rouse. Tall, handsome and out-going, the younger Luke was initially more interested in a career on the stage. At nineteen he joined a travelling dramatic company and spent the next decade touring Australia and overseas, often playing romantic or heroic roles. Throughout this nomadic part of his life, he always had a camera handy and took numerous portraits of his fellow thespians. He married a Ballarat girl, Elsie Speed, who would later take over management of his studio. 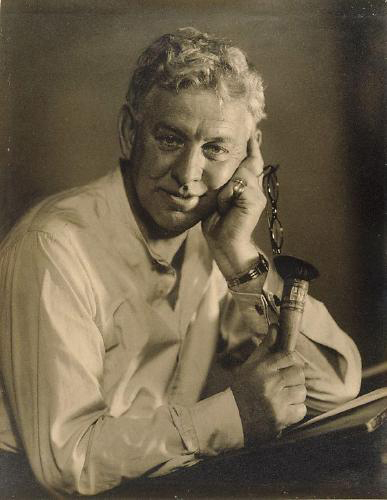 After being appointed official photographer for then theatrical kings J.C. Williamson Ltd, he made three silent movies for them; For Australia (1915), Within the Law (1916) and Seven Keys to Baldpate (1916). In 1919 Monte went into partnership with the Falk Studio, which was located within the historic Strand Arcade in Sydney. The Falk Studio was then well-established as one of Sydney’s most renowned photographic studios, having been commissioned to take the official portraits of the Duke and Duchess of York when the royal couple came to Australia for the Federation celebrations of 1901. Soon Monte set up his own business, also situated in the Strand, in the old studios of another well-known Sydney photographer L W Appleby. He specialised in social portraits and weddings, and also gained recognition for his work in advertising. Monte was invited to join the influential ‘Sydney Camera Circle’ in 1921 and many meetings of this elite group of photographers, which had been formed in 1916 with the objective of promoting a distinctive Australian style of pictorial photography, were held in his Studio. Two of the most prominent founding members of the Circle were Harold Cazneaux – often described as the father of modern Australian photography – and Cecil Bostock, later the tutor of Max Dupain, who would go on to international acclaim for his black and white Sydney beach scenes, landscapes and architectural studies. The Camera Circle moved local photography beyond the low-toned British style of print that was then the norm by introducing, as the visionary Cazneaux put it, ‘truly Australian sunshine effects’. Monte embraced this new direction and his light-filled landscapes took their place alongside his striking portraits as his signature. A lavish book of these landscapes, Under Sunny Skies, was published in the 1930s and the photographs were exhibited in the United States and Europe, winning a string of prizes. But it was Monte’s portraits – principally weddings and corporate, coupled with those from the arts, politics and sport – that paid the bills. While his good friend Cazneaux chronicled the changing face of Sydney, Monte recorded the faces of its people. He also accompanied another friend, Walter Burley Griffin, on the acclaimed architect’s journey to survey the site which is today Canberra, the national capital. Monte recorded that historic mission with what was even then regarded as an ‘old’ movie camera. In a way, he was following his father’s footsteps, for in 1902 Edmund Luke had accompanied the Senate delegation that toured various sites in New South Wales and Victoria, trying to determine where Australia’s new capital should be situated. A number of Edmund’s photographs of that expedition are held by the National Library in Canberra, including photographs of the senators at various sites around what is the ACT, from Lake George in the north to Dalgety in the south. Back in Sydney, the Monte Luke Studio built its popularity and reputation for excellence largely on its portrait work. Over many decades, Monte and his long-time associate Frank Froud recorded a fascinating range of subjects, from royalty to famous locals and international theatrical sporting and political personalities. Among these were the Duke and Duchess of York who came to Australia for the official opening of Parliament House in Canberra in 1927, and the Queen and Prince Philip when they toured Australia in 1954. Prominent political figures include Governors-General Lord Donrossil and Sir William Slim. There were celebrities such as Gladys Moncrieff, known to her public as ‘our Glad’ and described by J C Williamson as ‘Australia’s queen of musical comedy’, Anna Pavlova, considered to be the greatest ballerina of her time, another local star Nellie Stewart, and the prominent artist William Dobell. Many debutantes, businessmen, brides and families also flocked to the Studio. Over the decades the studio relocated several times, to Castlereagh Street and later York Street, before settling on its current location in Barrack Street, not far from Circular Quay. Into the 1950s Monte turned the running of the business over to his ‘right hand man’ Frank Froud, who had been with him since 1924. After Monte’s death in 1962, Froud stayed with the studio until 1989 – sixty-four years of service – when the present owner and operator Keith Friendship took over. Keith brought great photographic skills and a perceptive eye to enhance the already enviable traditions of the Monte Luke Studio. He also brought a similar passion for personal attention to each client’s session. As did Monte and Frank before him, Keith treats each assignment as a totally unique experience – from the point of view of both subject and photographer. Almost a century after the studio’s foundation, Keith continues to make the Monte Luke name and history, along with its wide array of photographic work, an integral part of the Sydney scene. ‘Monte Luke was one of Sydney’s great characters from what was a great era of Australian photography, and should be remembered as such’.